​We empower our children's inherent love of learning, inspiring and challenging each child to engage the world as an independent thinker, creative problem solver, and compassionate citizen. Founded in 1961, Alcuin Montessori is one of the oldest Montessori schools in the country. Our programs are designed to help each child become confident, curious, self-disciplined and motivated. The essence of the Montessori Method is to allow for the development of a child's individual potential while also encouraging participation in a community that emphasizes respect and cultural awareness. Classrooms are filled with materials that encourage creativity and emphasize sensory experiences. We offer Education for Life. Classrooms operate on the principle of freedom within limits. Children, under the guidance of a teacher, work at their own pace with materials of their choosing. Each student may work alone or with others. Different levels of ability are expected and welcomed within each classroom. Education occurs in multi-aged classrooms, where children of various stages of development learn from and with each other. Alcuin ("Al-quinn") Montessori School was established in 1961 by a group of six Oak Park families following a visit to the nation's first chartered Montessori school, the Whitby School. Children were seen working independently using Grace and Courtesy; three-year-olds were focused and concentrating on their work -- it was an amazing sight. Inspired by the visit, Alcuin Montessori was conceived and brought to fruition on September 6, 1961 when its doors were opened to the community. Classroom space was rented at the Lowell School and Mary Flynn, from the Whitby School, was hired as Alcuin's first teacher. Our first classroom had twenty-four children: a morning and an afternoon class for preschool aged children. And the rest, as they say, is history. Alcuin has been located at several sites in the Oak Park/River Forest area throughout its existence and is currently located at the First United Methodist Church just north of Lake Street in downtown Oak Park. Today Alcuin has roughly 140 students ranging in age from birth to 14 years, and 30 employees. In the fall of 2008, Alcuin opened a Middle School at a satellite campus Oak Park's Gale House, adjacent to Frank Lloyd Wright's Unity Temple. In the summer of 2019, we will open our new campus featuring a new middle school and all-day infant and toddler care. with a nod to Maslow’s Hierarchy of Needs. The school's mascot, "The Rock", was unearthed in 1968 when Alcuin was building its first school on ​Ridgeland Avenue and Randolph Street in Oak Park. 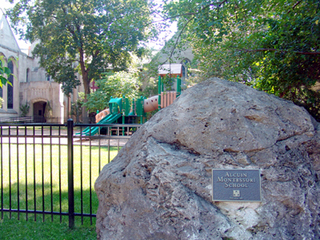 The Rock was moved in 1979 to Alcuin's new site on Keystone Avenue, in River Forest, and again in 1997 when it moved to its current location.